Update: Oct. 5, 6:31 p.m. Two suspects have been identified in the September shopliftings from Rocking R Ace Hardware. Kaitlyn Rebecca Allen, 28 years old of Stuarts Draft, is wanted for felony shoplifting for the Sept 20 incident, and Matthew Ray Fisher II, 27 years old of Waynesboro, is wanted for the Sept 22 incident. In addition, the Police Department is requesting assistance in identifying another individual involved in the theft on the 22nd with Fisher. Update: Sept. 28, 11:03 a.m. Both suspects have been positively identified thanks to tipsters calling in. Charges pending in both cases. First story: Sept. 27, 2:12 p.m. 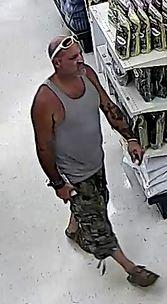 The Waynesboro Police Department is requesting assistance from the community to help identify two individuals involved in stealing from a city hardware store in a pair of separate shopliftings last week. In the first incident on September 20 at approximately 4 p.m., the suspect entered Rocking R Ace Hardware, 1000 W Broad Street, and walked around the store appearing to shop. She took some merchandise off the shelves and concealed it in a backpack that she was carrying. She then left the store wearing the backpack and walked to a newer model white Jeep Cherokee that was on the lot. The value of the merchandise stolen is about $180. The suspect is described as a white female in her late teens to early twenties, with dark hair. In the second incident on September 22 at approximately 1:30 p.m., the suspect entered the store and went to the restroom where he stayed for a while. He then picked up some merchandise and removed it from its packaging. He then nonchalantly walked out the main entrance of the store but he was pursued by store workers but evaded them and responding police officers. The value of the stolen merchandise is about $120. The suspect is described as a white male, in his early to mid-twenties, medium height, with facial hair.